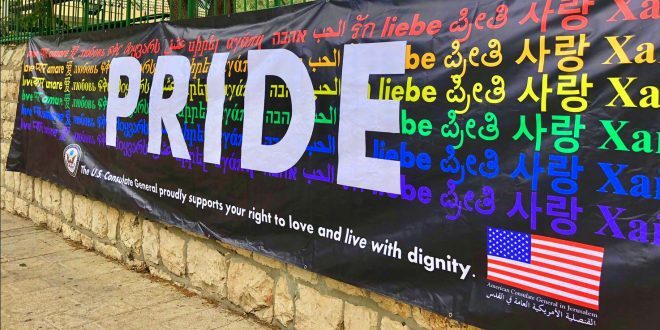 JERUSALEM: Hundreds Of Police Guard Pride Parade From Extremists, US Consulate Shows Support [VIDEO] - Joe.My.God. Two far-right groups held demonstrations in Jerusalem on Thursday, protesting against the city’s annual Pride Parade march and calling to protect ‘the normal family.’ Under the watchful eye of police officers deployed to keep the marchers and protesters apart, the extremist nationalist Lehava organization protested the march near its starting point in Liberty Bell Park. Activists with the group held up signs with slogans stating that “Jerusalem is a holy city,” and comparing the marchers to the Biblical Sodom. A heavy police presence kept them away from the marchers, three years after a deadly knife attack by an ultra-Orthodox zealot that killed 16-year-old marcher Shira Banki. The activists, who numbered a few dozen, scuffled briefly with police and said some of the group’s members were on an alleged police “blacklist” and were prevented from approaching the march. They also claimed that police officers “disguised as gays” infiltrated their protest and detained a number of their members. Far-right activist Itamar Ben-Gvir vowed to sue the police for “silencing” the counter-protest. An LGBT activist filed a police complaint against the right-wing Israel National News site website after it published a Hebrew opinion column that called for attacks on gays, the far left and radical feminists. The column was removed from the website after the complaint was filed on Tuesday and Israel National News apologized. Benzi Gopstein, the leader of the racist anti-miscegenation group Lehava is literally the Israeli version of Scar.